A loan of $25,000 helped make the improvements to a local community theater of over a 100 years, so it can continue to provide a unique space for films, live theater and music in Portland. I grew up in Moore, Oklahoma, the oldest in a family of five children. My dad was a lifer in the Air Force and my mom took in laundry and worked various odd jobs to make ends meet. I was the first in my family to graduate from college. Today, I live in Portland, OR with my husband of 29 years and our rescue dog, Buster. In the late 1990's, when Roger and I lived in New York, we owned and operated a successful computer software company that specialized in information management of employee benefits and human resources. We started with nothing but an unwavering belief in our product. We sold the company in 1999, after being in business for less than two years. At this time we had over $3 million in annual sales and a team of 50 full time employees and contractors. We decided to take one year off, and during that time we knew we wanted a life different from the one we were leading in the corporate world. We moved to Portland in 2001, lived off our savings, spent time with our first grandson, travelled in Europe and Central America, and I volunteered with hospice. I also went to film school and wrote and directed three feature length documentaries and numerous shorts. Seeing a film through post-production to completion requires far more hours and stick-with-it-ness than I ever thought possible, and as the owner/operator and wearer of almost all hats at the Clinton Street Theater, I count on that tenacious spirit to get things done. Most of my dreams these days center around the Clinton Street Theater. We've come so far in only five years, and I can't wait to see how our independent spirit and support for the arts evolves over the next five. It supports a mission-driven community space in Portland, Oregon. 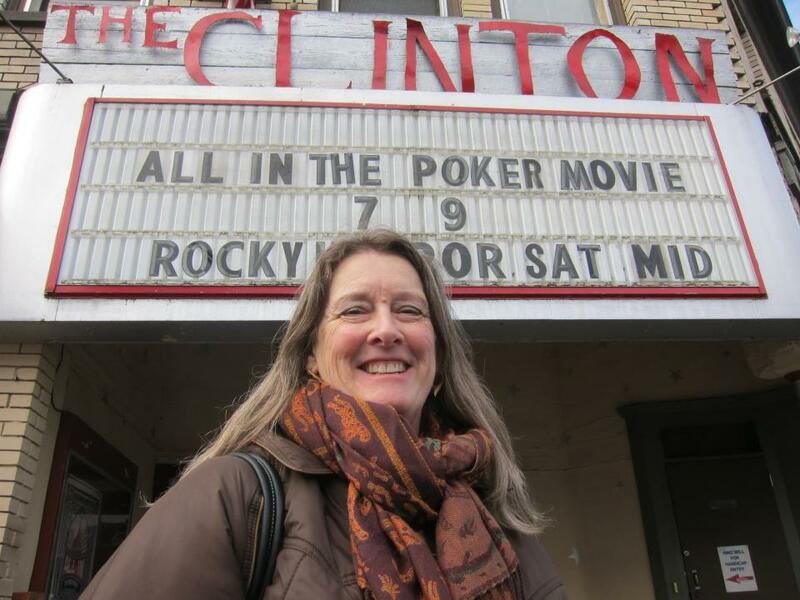 The Clinton Street Theater has been a neighborhood fixture in southeast Portland for more than 100 years, making it the oldest continuously operating movie theater in the northwest and one of the longest running theaters in the country. When the opportunity to buy the Clinton Street Theater came along in 2012 (through Craigslist of all places), I jumped at the chance. Although the theater had been mismanaged for years and its reputation in the community was shot, I could envision a warm and welcoming space that supported community-building through the power of independent film and live events. Under our ownership, CST is a mission-driven endeavor; to this end, we focus on truly independent film that is not screened elsewhere, champion a wide variety of live events from music to modern dance, and support the use of the theater as a community space for nonprofits and local artists. With so many competing choices for entertainment and with movies easily accessible on TV and computers, our biggest challenge is fostering the belief that movies are best seen in a theater with community. Our customers come from the Portland metro area and beyond--some even as far away as Bellingham and Walla Walla, WA. Last year we hosted our own film festival; and attendance keeps growing at all events. I'm proud of the fact that during my tenure the theater has been able to pay its own bills, while at the same time investing in new equipment and a screen. Also in the past year alone, we championed more than 40 nonprofits and helped raise more than $20,000 for their causes. This loan will assure that we keep the lights on and continue to provide our community with a unique space for films, live theater and music. It will allow us to install and maintain a 35mm changeover projector at a cost of $3,000 (this means more 35mm screenings and wider access to programming selection!). We need accessibility renovations (remodeling ancient bathrooms for ADA compliance), which will cost approximately $5,000. In addition, we want to make cosmetic repairs and restorations ( new auditorium doors to better insulate lobby noise, restore original historic design elements, fix or replace squeaky floorboards, retrofit the marquee with an energy-efficient LED system). Any repairs we make enhance the theater-going experience. With a more comfortable and attractive space, we will be able to charge more for rentals, gain a wider base of loyal, returning customers, and expand the ways in which the theater can be used. All of this will increase our overall revenue. Why are you endorsing Lani? I have known Lani Jo for many years. She is a prominent figure in Portland. Always promoting & supporting civic causes and indepentent film makers to bring important social & political issues to the forefront, to give voice to the underserved, to the unheard. Championing community support, she donates the theatre space for important events. In the forefront of making things happen. Very articulate, with good business acumen. And a very big heart.